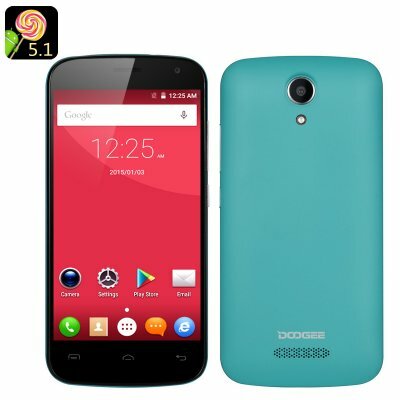 Successfully Added DOOGEE X3 Smartphone - 4.5 Inch Screen, Android 5.1, Dual SIM, Bluetooth 4.0, Smart Wake, Gesture Sensing (Green) to your Shopping Cart. Check out the newest from the well-known Chinese smartphone manufacturer – DOOGEE. This time, the company is rolling out a compact budget smartphone – DOOGEE X3, complete with Android 5.1, Smart Wake and Gesture Sensing, 3G connectivity on two SIM cards and more. You are probably already familiar with DOOGEE and the DOOGEE X3 is the manufacturer’s latest device. It comes with a 4.5 inch screen with 854x480 resolution, a quad core processor with 1.3GHz speed, Bluetooth 4.0 for smooth connectivity with other devices and more. The support of two SIM cards offers a convenient option of splitting your personal and work accounts and having two different numbers on one device. The phone supports a wide range of networks: 2G (GSM 850/900/1800/1900MHz) and 3G (WCDMA 900/2100MHz) and you are sure to stay connected in any part of the world. The DOOGEE X3 comes with Android 5.1 – and you can swing by the Play Store at any time to grab some of the latest apps, games and productivity tools. Don’t forget to try out the latest navigation features: Smart Wake and Gesture Sensing that allow you to get instant access to favorite apps from the locked screen or control the phone with hand movements.